MiR-126 is expressed in endothelial cells and associated with angiogenesis and inflammation, for example, its role in diabetes mellitus and coronary artery disease [16–18]. In human cancers, miR-126 has been revealed that is commonly decreased, and involved in many cellular processes such as proliferation, apoptosis, migration and invasion, e.g. 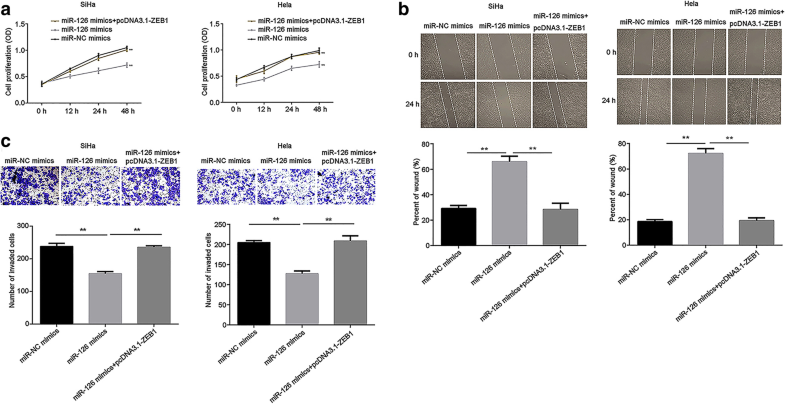 upregulation of miR-126 reduces cell proliferation and increases the apoptosis of colorectal cancer . Besides, miR-126 also suppresses glioma cell proliferation, migration and invasion [20, 21]. In addition, miR-126 is downregulated in breast cancer and suppresses metastasis in breast cancer development . Furthermore, miR-126 also serves as a biomarker for cancer prognostic prediction . In cervical cancer, previous studies about miR-126 have focused on drug resistance and chemo-sensitivity [14, 24], but the role in cancer biology is largely unknown. This study concluded that miR-126 expression was reduced in both tissues and cell lines of cervical cancer. Moreover, overexpression of miR-126 inhibited cell proliferation, migration and invasion. These results suggested that in cervical cancer, miR-126 acts as a tumor suppressor, which was concordant with its role in other cancers mentioned above. MiR-126 has a great influence on cervical cancer, which may be attributed to its inhibition of cell proliferation, migration and invasion through regulating various target genes . A previous study demonstrated a close relationship between miR-126 and ZEB1 in osteosarcoma . Meanwhile, bioinformatic analysis by TargetScan showed the 3’UTR of ZEB1 could bind to miR-126, and luciferase reporter assay confirmed bioinformatic prediction in our study. ZEB1, a member of ZEB family of transcription factors, acts as a driver of epithelial-mesenchymal transition (EMT) and cancer progression . It was reported that ZEB1 is abnormally expressed in various human cancers and commonly involved in cell migration, invasion and metastasis . For instance, ZEB1 expression is elevated in prostate cancer and inhibits cell proliferation and invasion . Additionally, in non-small cell lung cancer, ZEB1, as a target of miR-445, reverses its inhibition of the proliferation, migration and invasion . 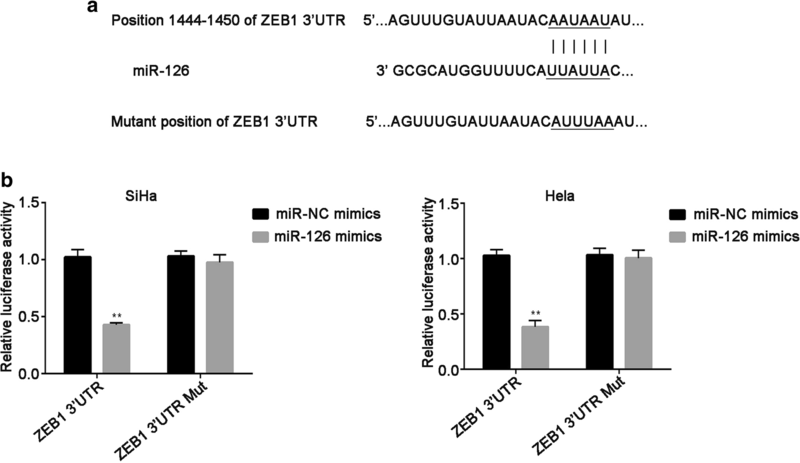 ZEB1 switches with cervical cancer as a target of several miRNAs, such as miR-211, miR-429 and miR-484 [31–33]. In the current study, upregulated expression of ZEB1 was found in cervical cancer tissues. Moreover, its expression was negatively regulated by miR-126 at mRNA and protein levels in SiHa and Hela cells. Furthermore, the impact of ZEB1 on the proliferation, migration and invasion was opposite to those induced by miR-126 overexpression. These findings demonstrated that ZEB1 has the positive effect on cervical cancer and further confirmed that ZEB1 is a target of miR-126 meanwhile.